Palmdale and Lancaster deputies on Jan. 27 had the honor of meeting 9-year-old George Rios, and the terminally ill boy had the opportunity to see one of his many dreams come true. 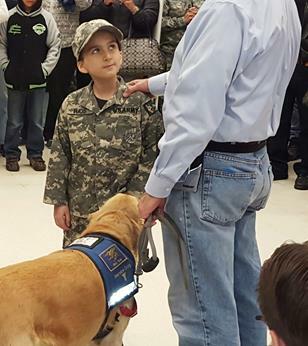 George, who has cancer, has always dreamed of becoming a K-9 dog handler with the United States Army. So what did our amazing military do? They made his wish come true! This past December, local recruiter SFC Armondo Delgado had a special ceremony for George by swearing him in as an Army K-9 dog handler. 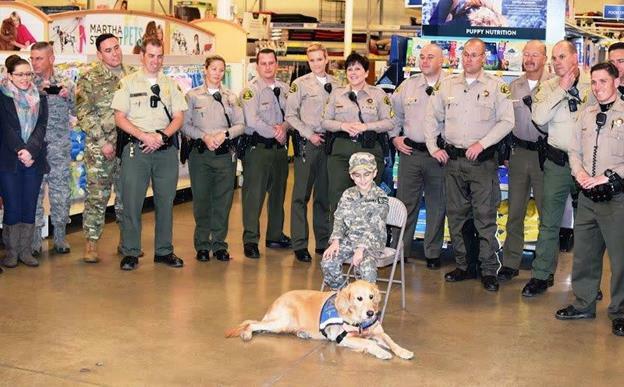 Then the US military, For Veterans Sake Foundation, Lancaster PetSmart and the LA County Sheriff and Fire departments rallied together to create a “suspicious package” scenario to give George his first assignment as a K-9 handler. George and his dog “Katie” did an incredible job “sniffing” out the package and ultimately saved the day! Many community members displayed their support by showing up for George’s first day on the job. It was a great way to make a little boy smile and to witness the community pulling together when someone needs our help. A special thank you goes out to the For Veterans Sake Foundation for arranging this event. The For Veterans Sake Foundation is an organization that provides alternative solutions to dealing with Post Traumatic Stress Disorder (PTSD). For more information, visit http://forveteranssake.org/. 20 comments for "Terminally ill boy and K-9 partner save the day"
This story mourns my heart. I will still pray he lives a long life. I believe in miracles. What an incredible thing they have done for this child. He is such a precious little soul and he did not ask for this life. I pray the entire family has strength to go through what they are going through. This can happen to any of us. Cancer can get us at any day. Give thanks every living day for another day. I am proud of all of our servicemen involved, and for every officer and anyone else who made this possible for this child. The child is dying, and you begrudge him a few minutes of pleasure, of doing what he has dreamed, just because you think the Sheriff’s dept is bad, or you think they should have more minorities. Well go tell the child’s parents that you don’t think that their son should be honored in this way that it is a waste of taxpayers money, see how far this gets you. I am sad for the parents who will lose their baby, I am sad to know there is a soul who will not be able to live up to its potential and grow. Shame on all of you who use this article as a way to slam the Sheriff’s dept, if you obeyed the laws they would be out of work. And as far as him being another Justin Bieber, I think one is enough. What a wonderful story! Thank you for sharing it!!! Complete and utter ignorance….Always a racial comment, really???? Sorry. Any 9 year old whose life dream it is to be a K-9 dog handler with the United States Army as opposed to a fire fighter, astronaut or the next Justin Bieber is heavily indoctrinated or used for propaganda. I’d argue that boy who wants to be the next Justin Bieber is even more indoctrinated. you are so insensitive and ignorant to the pain of a mother and the lengths on which a caring community will go to grant the wish of a terminally ill child. you should not comment on stories such as this one, if you don’t have anything positive to say. Not to take away from the awesome job these adults did for this child, but I got to ask. Do we have ANY minority sheriffs in the AV? At all? Wrong, look at the other story, go through the community class and find out for yourself, there are tons of minority sheriffs! My skin head is due to age, balding. Police do something good and still get criticized? Go figure. And yet when I point out that the sheriff’s department has completely lost credibility and is pretty widely despised people say “only among criminals.” As you note, the reality is that even when they pull off what should be a feel good story their reputation drags it down. Why does that effing matter ???????????? ?